In the center of San Franciscos Union Square. One block to the Globe Famous Cable Car. Walking distance to cafes, museums, theaters. The hostel had a exceptional atmosphere and offered lots of activities to keep travellers busy. The breakfast bagels were delicious along with the kitchen properly run. It&'s a very nice hostel located downtown SF. The cooking area and breakfast is really good along with the activities offered by the employees are fun! The rooms are nice but simple. I would certainly go there again! Great location in Union Square, often felt safe and comfortable. Breakfast provided was great. Very good value for money, a nice, clean room and lots of activities to get involved with. Amazing location, really friendly atmosphere. The bike tour was amazing! 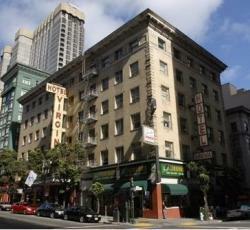 * Hostelling International San Francisco Downtown rated 4.89 out of 5 based on 9 customer reviews. Hostel reviews with a star rating are sourced from HostelBookers. If you find Hostelling International San Francisco Downtown with the same booking conditions at a lower rate somewhere else on the internet after you have booked, we will refund you the total difference.